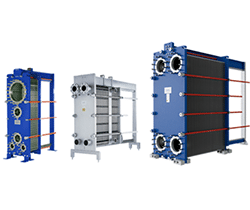 WideGap plate heat exchanger for general heating, cooling and heat recovery of media containing fibres and coarse particles. The wide-gap channels are suitable for highly viscous fluids. Mechanical design pressure 1.0 - 1.6 MPa. Alfa Laval BaseLine plate heat exchangers are designed for gentle food and pharmaceutical applications. Its modular design offers different combinations of plates and frames to cover a wide range of applications, including all general heating and cooling duties, and small capacity pasteurisation. FrontLine plate heat exchangers are tailor made for food and pharmaceutical applications. They can meet the most demanding requirements in hygiene, while promoting production uptime and saving energy. They can handle fluids with fiber or viscous products, high pressure and high temperature pasteurisation, and very gentle cooling. M-Line plate heat exchangers are the ideal choice for use in pasteurisation and general cooling/heating of dairy and brewery products, fruit juices and similar food products.